I know a lot of us have trouble fitting in workouts. We have the best intentions to get to the gym, but things come up and suddenly we’ve gone two weeks without working out. It’s easy to miss workouts if you don’t have a good plan on how to prioritize them. 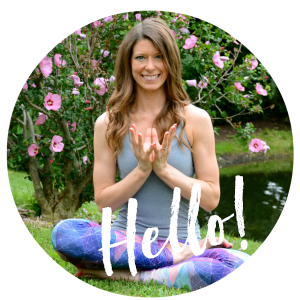 Today I’m sharing the system that I use to take charge of my workout schedule and fit all of my training into my crazy life. 1. Find a calendar where you can schedule your workouts. I love using my Google Calendar because my phone reminds me when I have something scheduled, but even a paper calendar works if you stick with it. It’s all about finding what works best for you and how you operate. 2. Schedule your priority workouts. If you’re training to run a race, schedule your training runs. If you just want to get active, schedule your favorite activity, whether it’s using the cardio machines or going to a class, three to four times a week. These core workouts are the workouts that you absolutely need to meet your goal, whatever that goal is. Struggle with tackling your workout schedule? Check out these tips! 3. Schedule other workouts. Then, add in activities to your workout schedule that you’d like to do, but if you don’t get them in it won’t drastically hamper your ability to achieve your goals. Maybe if you’re training for a marathon you’d really like to make it to a Zumba class once a week, but sometimes life gets in the way. Skipping that Zumba class won’t have a huge effect on whether you finish your marathon or not. I personally code these extra workouts in a different color to help keep things straight. 4. Stick to your schedule! When you’re first starting out, sticking to that workout schedule can be tough, especially when you’re not used to that schedule. It takes 30 days to make a habit, so really focus on sticking to your schedule for the first month. 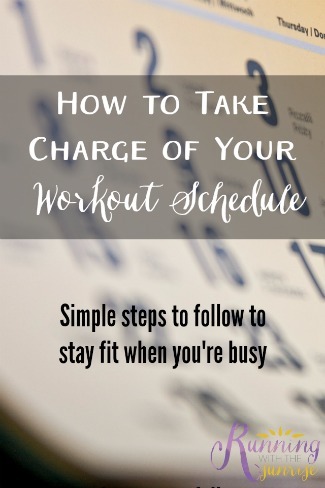 After that, you should be used to fitting workouts into your busy schedule, and things should feel more routine. You’ll just know that when your alarm goes off at 5:30 it’s time to head out for a run, for example. Do you have any tips for keeping a training schedule? My biggest tip is to mark it down like an appointment. No excuses! Exactly. I’ll even schedule my workouts for a certain time like an appointment so I know I have time in the day to get them in. Really the best advice I have is to make a schedule and stick to it. By making exercise a priority, I am less likely to blow it off for something else. Yes, you really do have to prioritize it. If you think it’s not important, you’ll slack. I think it’s a change in outlook, too, for most people. Thanks, Jamie! And totally agree about accountability with others. 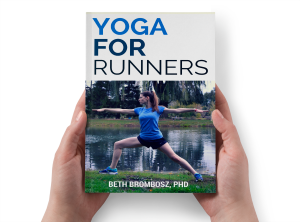 It’s what helped me stay motivated to train for Ragnar–even though I was training alone, I knew I didn’t want to let my teammates down. This is essentially how I train for my marathons. I like juuuuust enough structure, but I like to pencil things in (and pen for later, in case something happens). But yes, you must prioritize. The system works, right? Glad to hear that this works for others, too! I definitely like to have a pencil schedule, not permanent ink – I need to be able to change it up according to mood and physical condition, but also to have a ‘grand plan’ in place. Seeing the forest through the trees is how I call it! This is very true. Listening to your body is so important. Sometimes I like to schedule a run in ink, but pencil in what exactly I’m doing in the run, so to speak. I’m all about a schedule and my planner! I need to come up with my marathon training plan this weekend 🙂 So I can start putting it in my agenda. I often plan my weeks around workouts. Great tips. I always schedule all my workouts on my calendar like they are meeting I cannot miss. Exactly! If you know skipping them isn’t an option, you’ll stick to it. Great way to think about it! I schedule my workouts like I do doctor’s appts. Not to be missed. Also, truly realizing the time you have to workout and making the most of it. I don’t always have an hour to workout so if it’s 30 minutes I make the most of that 30 minutes. Love it! If you want to get healthy, you really do need to prioritize fitness activities like you would other important things. And you’re so spot on about making the most of whatever time you have. Great tips! Exactly! When you get a routine or habit, it’s much easier to stick with exercise or whatever it is that you’re trying to keep up with.